If you're interested, head over to my Lauren Wayne writing blog for some samples of this month's Poem-a-Day Challenge so far. I've been trying to write as much parenting poetry as possible this year, and I've put up some first drafts there. 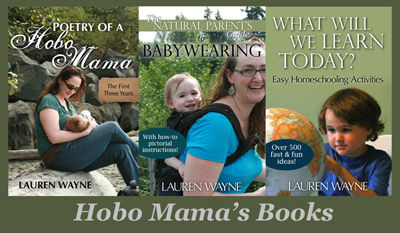 Here are a couple bonus poems for you here, with the prompts from Poetic Asides that inspired them, and then you can click over to LaurenWayne.com to read more if you're in a parenting-poetry mood! Day 19: For today's prompt, write a poem about somebody and be sure to include the person's name in the title of your poem (no reason to hide the person's identity here). Write a poem about Abraham Lincoln, Emily Dickinson, Mohandas Karamchand Gandhi, your next door neighbor, your child, or the person standing behind you. I guess you could even technically write a poem about yourself (just make sure you include your name in the title). where you'd pounded out your mark. Day 21: For today's prompt, take the phrase "According to (blank)," replace the blank with a word or phrase, make the new phrase the title of your poem, and then, write the poem. Example titles might be: "According to Bob," "According to these instructions," "According to the government," "According to the sun," etc. something that heavy must come down. defying the pull to the outside? an object in perpetual motion. you laughed off and spun away. More poems up now at LaurenWayne.com! P.S. Thank you in advance for being kind. I post poetry only with great trepidation. If you've shared any of your poems on your blog, let me know so I can go enjoy! made me a little weepy.